Dhingana, Pune based Indian music streaming service has partnered with Idea cellular to offer unlimited music downloads streaming to Idea subscribers without incurring any data charges. With mobile tariff’s set to increase, Mobile VAS offerings are the next frontier for Telecom operators in India to gain new subscribers on their network. Idea recently became 3rd largest operator in India after after reliance culled over 10 million users from their network on account of non-usage. Dhingana already has free Android and iOS apps that offer free music streaming to users. While on iOS they have a premium version called Dhingana Gold, Android app has only the ad supported version. However, in both the cases the user attracts data charges for music streaming and downloads. Interestingly, the offer of free music downloads is extended to Android users only that are on Idea Network. We tried using it, and normal music streaming did not seem to attract any data charges when we used. However, when we tried downloading songs, it asked us to subscribe to their service at a cost of Rs. 50 which was valid for 30 days and would allow only 50 song downloads. So, it seems that if user wants to download it and hear offline, they will need to subscribe at cost of Rs. 50. Also, because of the partnership in place, the billing will be done through idea itself and charges will be either deducted from the balance for pre-paid users or will appear in monthly bill for post-paid users. The music downloaded through Dhingana mobile app will be DRM protected and will be played through mobile app only – It cannot be played through any other music player. Also, music streaming is available through Idea Mobile WAP with some restrictions apart from Dhingana mobile app. According to the terms and conditions given on Dhingana site, but it was not clearly mentioned whether data charges are applicable for only streaming music without the subscription. You can see the T&C here. 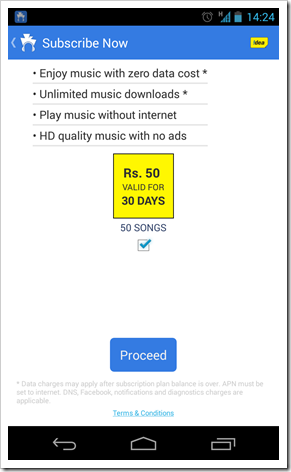 Flipkart Flyte MP3 Store goes down – Piracy won?